Galectin-7 belongs to growing family of evolutiory conserved animal lectins. Galectins consists of beta-galactoside binding lectins that contain homologous carbohydrate recognition domains (CRDs). 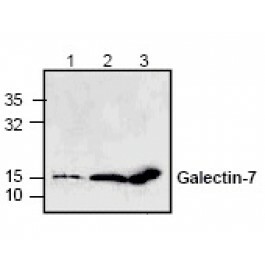 Galectin has the ability to induce apoptosis of activated T-cells and T-leukaemia cell lines. Other activities include cell differentiation and inhibition activity of CD45 protein phosphatase activity. Galectin also binds beta-galactoside as well as CD45, CD3 and CD4. Recombint Human Galectin-7 is a 15.4 kDa protein consisting of 136 amino acid residues.